Following a jam-packed day of famous Jeju sights and flavors, the Harringtons were eager to get some beach time in so Mike could swim and Melissa and Lady could lounge. 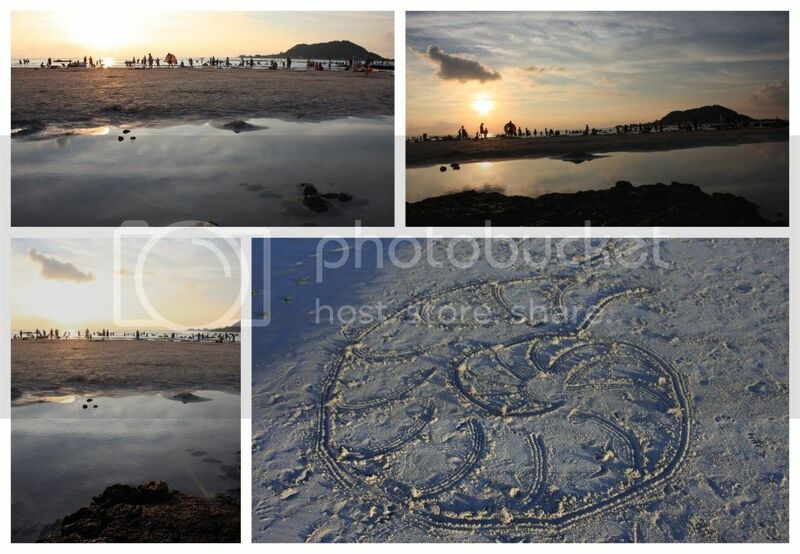 Fortunately, island life lends itself well to finding beaches and providing exactly what it was the couple was searching for. With very little effort, the couple soon had their parasol spot paid for and staked out, Melissa lounging, Lady crashing and Mike getting ready to dive into the cool, refreshing ocean. As the sun set, Mike returned to the parasol location and made plans to pitch the tent on a grassy knoll which would provide the perfect, peaceful setting for the rest of the evening and ensure the Mrs. and the pup would have a lovely walk in the early morning hours. However, before Mike could commit fully to setting up the tent, the couple was engaged in a conversation with a parasol neighbor. 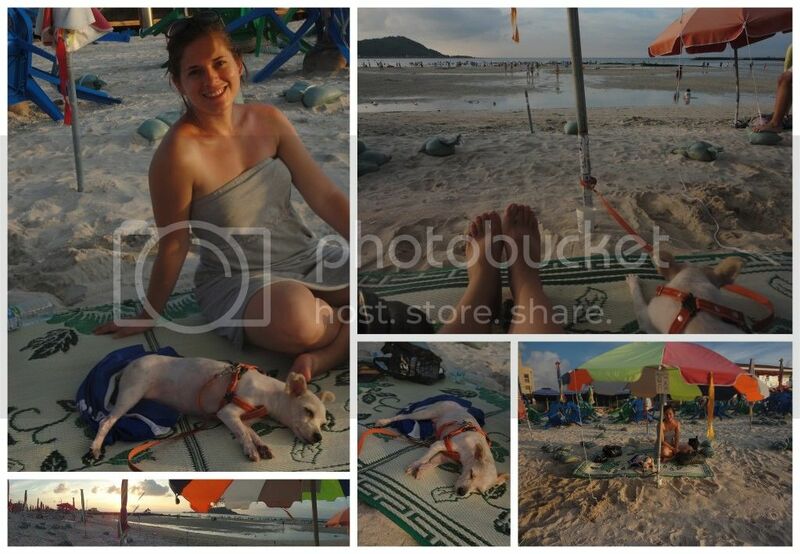 A Korean family had also taken this week of August to vacation on Jeju and were intrigued by this foreigner couple who was not only lounging around on the beach, but doing so with a three-legged dog. The Korean family proceeded to ask how the Harringtons had come to the island and how they managed to bring their sweet pup. Melissa politely explained that they had taken the car ferry and were avoiding hotels and the such and rather opted to camp so that they could have their furry friend with them the duration of the vacation. The Korean family then shared that they too had a sweet furry friend but unfortunately had not brought her along for the joys of vacationing. And before long, they were sharing their fried chicken with Lady Annyeong and a stray and wishing the Harringtons an enjoyable continuation of their vacation on Jeju. Finally able to set up the tent, Mike went to work getting things ready while Melissa showered for the day at the beach-provided shower-house (a true convenience when you opt to camp rather than get a hotel room!) Having finished his 'duties' it was Mike's turn to shower before the couple sat down at the beach restaurant and ordered a plate of fried chicken. Unfortunately, the hours at this particular shower were limited, and Mike found himself going without a shower for the evening, much to the Melissa's delight. 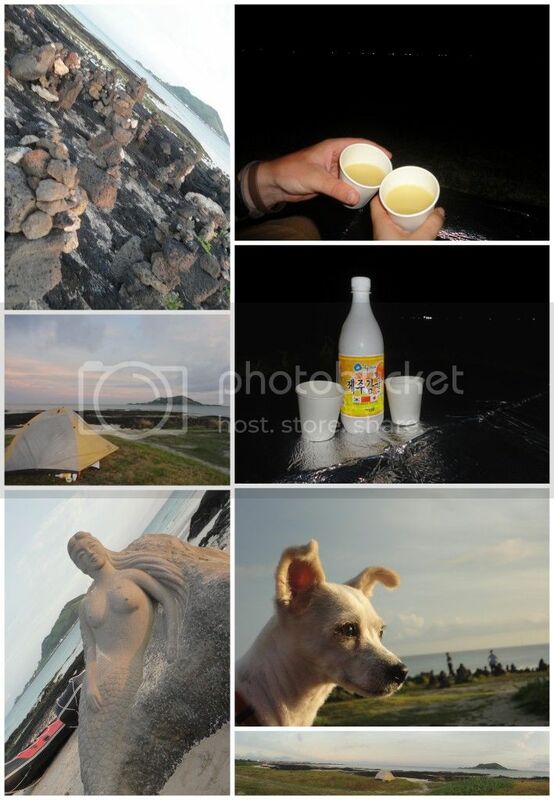 With full bellies, the couple decided to top the day off with a bottle of Jeju's special orange makeoli (a Korean rice alcohol) before hitting the sleeping bags and drifting off into a good, peaceful nights sleep.